Homebuyers looking to build a custom modular home in Colorado will now have to look out of state to get their home built. Despite rising demand for building modular in Colorado, several modular home manufacturers have closed factories in the state in the last six months. With the recent closures, prices for building a pre-fab home in the Centennial State may be on the rise due to increased transportation costs and limited design capability. However, custom modular home builder Irontown Homes, with its factory in Spanish Fork, Utah, is helping to meet the demand and limit the rising costs of building luxury, custom modular homes in popular resort towns like Aspen, Vail and Telluride. Irontown provides a versatile state of the art factory only 350 miles away, versus over 1,000 miles, as is the case with other factories servicing the area. Building custom homes in its Utah factory, Irontown Homes specializes in constructing and shipping modular homes to metro areas, resort towns and remote home sites throughout the Western United States. Irontown Homes has been building modular homes for more than 25 years and operates in its state-of-the-art 60,000 sq. ft. facility. As much as 80% of the construction of each home Irontown Homes builds is completed in the climate-controlled factory before the home is shipped. When the modules arrive at the home site, each module is craned into place in a single day and the home is then stitched together and finished in a process that takes just weeks to complete. With All American Homes selling its Milliken, CO based factory recently and Wardcraft closing its Greeley factory last summer, costs related to shipping modular homes to Colorado home sites could potentially raise the total home cost by thousands of dollars depending on where the home is built. 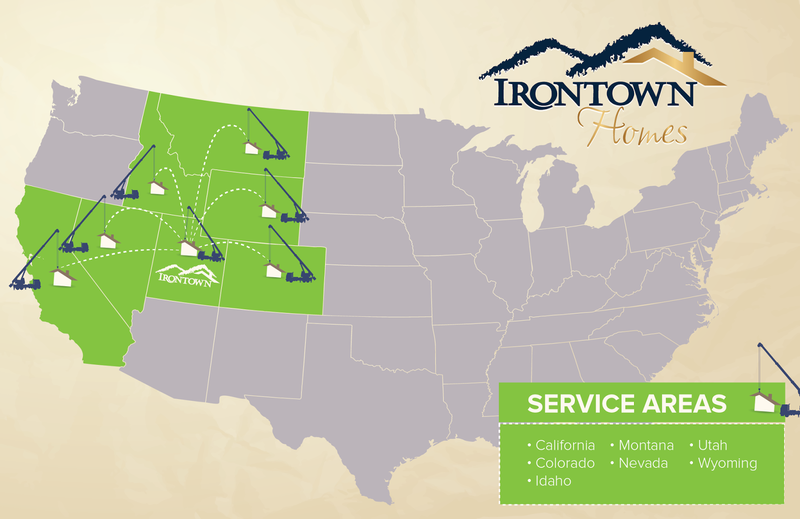 Irontown Homes’ proximity to many potential home sites including Aspen, Snowmass, Vail and Telluride and Irontown’s unlimited design capabilities can help homeowners get into the home they really want while significantly reducing the shipping costs associated with building a modular home. Irontown has always focused on higher-end, custom homes, rather than trying to squeeze a custom home out of a production-model factory. Modular and pre-fab homes constructed by Irontown Homes are built to rigorous “Better than IRC” engineering standards to withstand the shipping and craning involved in transporting and setting the home. Irontown Homes utilizes cutting-edge building technology with an energy-efficient construction process that reduces the time it takes for a homeowner to move in while limiting the environmental impact of building a home. Irontown Homes has set a standard of exceeding quality and environmental standards in each home it builds. Each home undergoes extensive quality control and quality assurance throughout the entire home building process. Ironic that Modular manufacturers are retreating from a high dollar high value market perfect for we custom modular construction. Kudos to Ironton and their sales team.